The Exciting new Celebrity X - 3 wheel scooter is a feature rich scooter designed specifically by Pride based on consumer feedback. The Celebrity X has many great features, including an auto-latching lock-up for quick disassembly/reassembly. The Delta tiller is a standard feature which offers ease of use for those are challenged with dexterity. The deluxe seat offers swivel, sliding and height adjustment. The flip-up, padded armrests are width adjustable. This unit has a 350 lb weight capacity, top speed of 6 m.p.h., and 3.5" of ground clearance. The Celebrity X is a perfect blend of style and technology. The many standard features and affordable pricing make this scooter a great value. Full rear "soft ride" suspension. Wrap around "Delta" tiller offers easy control for most any driver. The deluxe molded seat is 19" w x 16" d, and is completely adjustable with swivel, sliders and height adjustment. Premium upholstered seat with double reinforced seams and molded cushions. Ultra simple, auto-latching lockup for quick disassemble / reassembly. Weight w/o batteries 141.5 lbs. Front frame-mounted seat post for optimal stability. Easily accessible tie down points for transport of unoccupied scooter on vehicle lifts. Heaviest piece when disassembled is the front section at 56 lbs. Structural frame components; including, platform, fork, seat post, and frame. Drive train; including, transaxle, motor, and brake. 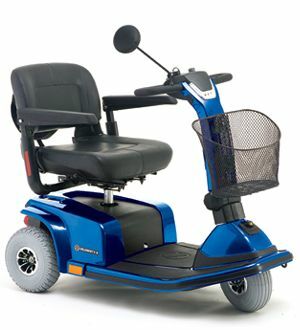 For one year from the date of purchase, Pride Mobility Products Corporation will repair or replace, at our option, to the original purchaser, free of charge, any part found upon examination by an authorized representative of Pride Mobility Products Corporation to be defective in material and/or workmanship. The Battery is warranted by the battery manufacturer. The battery is not warranted by Pride Mobility Products Corporation. Warranty service can be performed by a dealer authorized by Pride Mobility Products Corporation or by Pride Mobility Products Corporation. Do not return faulty parts to Pride Mobility Products Corporation without prior consent. All transportation costs and shipping damaged incurred while submitting parts for repair or replacement are the responsibility of the original purchaser.